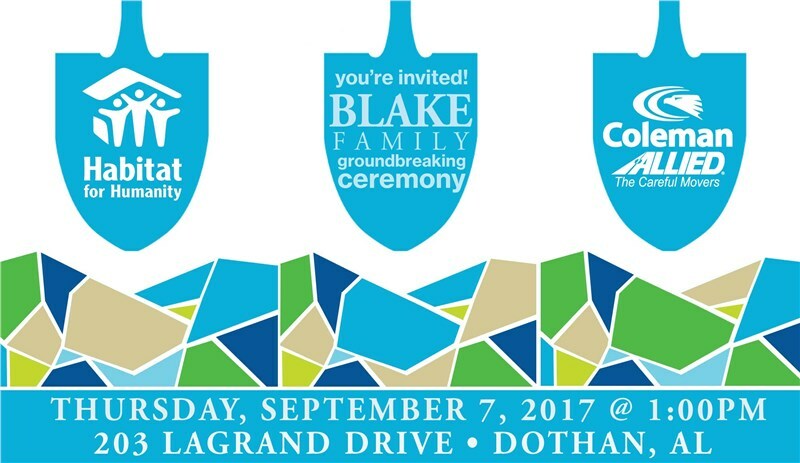 Wiregrass Habitat for Humanity will celebrate the construction of its 128 home at a ground breaking ceremony Thursday, September 7, at 1:00 p.m. at 203 Lagrand Drive in Dothan. The future homeowners, Willie and Candace Blake, are excited to see the beginning of their home. This home will become reality because of the employees of Coleman Worldwide Moving and the Coleman Family Foundation. Many volunteers will work with Wiregrass Habitat for Humanity and the Blake family over the next few months to raise this home from the ground up. Volunteers will work on Saturdays and during the week to see this home built. Through donations of money and materials and volunteer labor, Wiregrass Habitat for Humanity will be able to build the home and sell it at an affordable price. The Blake family will purchase the home with a no-profit loan, and their monthly mortgage payments will be used to continue the mission of eliminating substandard housing in the Wiregrass. Amy Schutz, Executive Director with Wiregrass Habitat for Humanity, said "It is always a special day to break ground on our next home to be built. Being able to include not only our future homeowners, but those that are making this possible is a way for the homeowners and the community to see what we are able to do when we work together." For information on upcoming builds and volunteer opportunities with Wiregrass Habitat for Humanity, contact Emily Brannon at (334) 792-8453 or visit our website at www.wiregrasshabitat.org. Wiregrass Habitat for Humanity is faith-based, non-profit organization dedicated to the elimination of substandard housing in the Wiregrass and has built 127 homes since 1990. For more information, visit www.wiregrasshabitat.org.